Paul Crowley talks with his friend and fellow veteran Anthony Bravo Esparza, who calls himself "Dreamer," about the free haircuts he gives in a VA Hospital parking lot. Many veterans seek out the West Los Angeles Veterans Affairs Hospital in hopes of feeling better. Thanks to Anthony Bravo Esparza — known to his friends as “Dreamer” — those veterans often end up looking better, too. Since the 1970s, Dreamer, a veteran himself, has been giving free haircuts to vets. He can be found in a red, white, and blue painted trailer parked at the VA, where he averages about 200 haircuts a month. Last year, Paul Crowley showed up looking for a trim. Today, he’s Dreamer’s assistant. 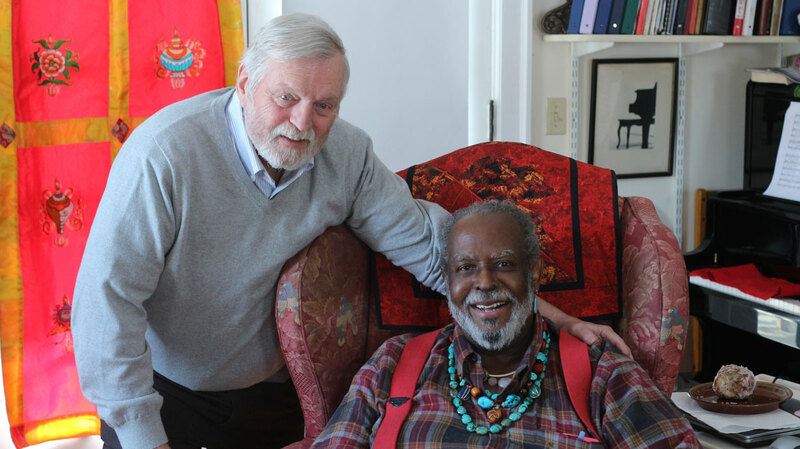 At StoryCorps, the pair sat down to speak about their friendship. Frank Lilley interviews his stepfather, David Plant, about approaching the end of his life. This is a story about reaching the end of life. It was recorded as part of StoryCorps’ Legacy Initiative–an effort to collect interviews with people who have life-threatening conditions. In 2010, David Plant was diagnosed with skin cancer. Since then, the cancer has metastasized in other parts of his body. 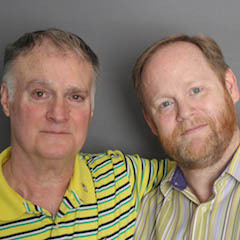 David sat down for a StoryCorps Legacy interview with his stepson, Frank Lilley. Lisa Combest and her ex-husband, James Hanson-Brown, talk about how their marriage ended. It’s not often that couples split up and stay close friends. But that’s what happened to James Hanson-Brown and his ex-wife, Lisa Combest. They fell in love in high school, got married, and began to grow apart. 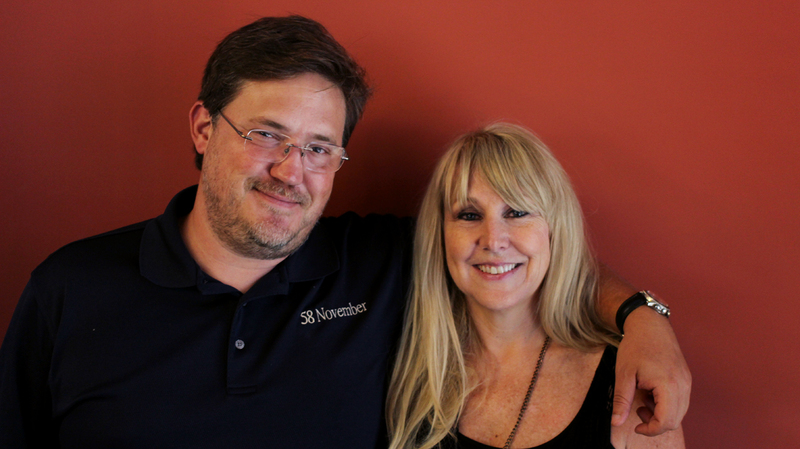 At StoryCorps, they remembered how their divorce deepened their relationship. Two stories about teachers who went beyond the classroom to help their kids. For students who are struggling, sometimes the difference between success and failure can start when a teacher takes the time to listen. In these two stories from our National Teacher’s Initiative, teachers go beyond the classroom to help their kids. In 2004, Kate Musick was teaching third grade at T.C. Walker Elementary school in Gloucester, Virginia. When Harleé Patrick walked into the room, Musick saw a troubled child. Harleé is now a teenager, and the two came to StoryCorps to talk about how she made it through that year. The second story comes from Los Angeles, where 19-year-old Jose Catalan, who is studying to become a math teacher, sat down with his former high school teacher Carlos Vizcarra to talk about how they became friends. José Rodriguez tells his former coach Charles Zelinsky how he got involved in the Special Olympics. When he was a teenager, José Rodriguez was kicked out of public school. He was diagnosed with a learning disability and sent to a school for students with special needs. This qualified him to participate in the New Jersey Special Olympics -- any child or adult with an intellectual disability can take part. At StoryCorps, José told his former coach Charles Zelinsky what his life was like before he found the games. José is now a Special Olympics basketball coach -- and will be coaching during the 2012 New Jersey Summer Games. Army National Guard Capt. 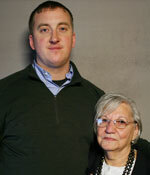 Zachariah Fike speaks with Adeline Rockko about returning her brother's lost Purple Heart medal. Captain Zachariah Fike is an Army National Guardsman on a special mission. He finds Purple Heart medals for sale in antique stores and on the internet, buys them, tracks down their rightful owners, and returns them. So far, he has reunited five families with lost medals. The first one belonged to Corrado Piccoli, an Army translator who was killed in Europe during World War II. At StoryCorps Captain Fike and that soldier’s sister, Adeline Rockko, remembered their first conversation. Happy Dodson and Taz Roman, members of Bikers Against Child Abuse, talk about their work. If you saw Happy Dodson and Taz Roman roaring down the street on their motorcycles, you might be surprised by where they’re going. 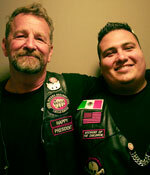 Happy and Taz are members of an international group called Bikers Against Child Abuse. Social workers, cops, and others refer children who have been abused to the bikers, who have to pass a federal background check. When they don’t feel safe, the kids can call Happy, Taz and their biker friends who come straight to the child’s house. Glenda Elliott, 75, tells her friend Angela Stowe about the love of her life, and what it was like to love another woman long before the gay rights movement. Glenda Elliott grew up in Mayfield, Georgia during the 1940s. Long before the Stonewall Riots launched the modern gay right movement she met the love of her life — another woman, named Lauree. When Glenda sat down with her friend, Angela Stowe, she told the story of this life-long love that never had the chance to blossom. On October 4, 1971, George Giffe, a 35-year-old Tennessee man suffering from mental illness hijacked a charter plane at gunpoint from the Nashville airport. Andy Downs, the son of one of the two hostages killed that day speaks with Angelia Sheer, the daughter of the hijacker. On Oct 4, 1971, George Giffe, a 35-year-old Tennessee man suffering from mental illness, hijacked a charter plane at gunpoint from the Nashville airport. He also claimed to be in possession of a bomb. Running low on fuel, the plane’s pilot landed in Jacksonville, FL, where the FBI was waiting. After a brief standoff, Giffe killed the two hostages who remained onboard before turning the gun on himself. One of the two was Brent Downs—the pilot of the plane. At StoryCorps, Brent’s son Andy spoke with Angelia Sheer, the daughter of the man who killed his father. Marjorie Klindera and Carol Miller have spent the past 30 Thanksgivings answering phone calls about turkey troubles from panicked home cooks. Marge Klindera spent decades teaching home economics to Illinois middle and high school students. As she was transitioning into retirement, she began looking for other ways to share her years of knowledge and experience. In 1983, she began working at a seasonal call center—answering questions from those needing last-minute information on cooking a turkey. Each Thanksgiving, for more than 30 years, Butterball has run their Turkey Talk-Line. Operating from October to December, trained professionals like Marge answer thousands of turkey related questions from home cooks across the United States and Canada. At StoryCorps, Marge, 79, sat down with her longtime coworker, Carol Miller, 68, to remember some of the best callers they have had, as well as some of the best advice they have dished out. Tom Graziano remembers how his son’s elementary school principal and the community responded when they learned that his son was HIV positive. In the early 1980s, Tom Graziano and his wife adopted an almost 2-year-old boy named John. As a child, he was constantly sick, but doctors where never able to determine why. In 1986, when John was in the second grade at Central Elementary School in Wilmette, Illinois, his parents discovered the reason for his health problems—John was HIV positive having contracted the disease from his biological mother. At StoryCorps, Tom sat down with John’s elementary school principal, Paul Nilsen, to discuss the reaction of other students attending the school and among members of their suburban Chicago community to John during the AIDS epidemic in America. John died in May 1989, just days shy of his 10th birthday. High school juniors Akiva Johnson and Henry Jimenez talk about the friendship they developed while taking part in the StoryCorpsU educational program. Henry Jimenez and Akiva Johnson, both 17, are classmates and close friends at the High School for Youth and Community Development in the Flatbush section of Brooklyn. Now juniors, they met freshman year while participating in StoryCorpsU. StoryCorpsU is an interactive year-long program for high school students that utilizes StoryCorps interviewing techniques, radio broadcasts, and animated shorts to support the development of identity and social intelligence in students. One aim is to help teachers better appreciate and understand students as whole people by encouraging teens to share their experiences outside of the classroom with those in the classroom. In their StoryCorps conversation, Akiva and Henry discuss the challenges they have had to confront in their daily lives, and how grateful they both are for the support—often unknowingly—they have provided each other, by sharing stories they have never before told. While they were talking, Akiva revealed that in October 2012, after Hurricane Sandy devastated much of the eastern coast of the United States, he and his mother were displaced from their home. They spent parts of the next three years in homeless shelters across New York City—including last Christmas—something Henry was unaware of. Henry has also had to overcome difficulties. When he was 13 he left Mexico and came to the United States to live with an aunt, leaving behind his parents and younger brother. The challenges faced by a young boy coming to an unfamiliar country were eased by the support he received from Akiva. They both expect that their friendship, which was forged in school by having the opportunity to open up and share personal stories, will endure—even after Henry follows his dream and enlists in the Marine Corps. Click here to learn more about StoryCorpsU. François Clemmons played Officer Clemmons on "Mister Rogers' Neighborhood." He came to StoryCorps to discuss the role and his life. In February 1968, the children’s television program “Mister Rogers’ Neighborhood” debuted nationally. Besides its eponymous creator, the show also featured a cast of characters from Mister Rogers’ make--believe world (King Friday XIII, Daniel Striped Tiger, and Bob Dog), and his “real” world (Mr. and Mrs. McFeely, Lady Aberlin, and Handyman Negri). François Clemmons was cast in the “real” world as Officer Clemmons. Fred Rogers met François in 1968 after hearing him sing in a Pittsburgh--area church they both attended. He was so impressed with his voice that he asked him to join the show. At the time, François was a graduate student working on getting his singing career going and was reluctant to accept Fred’s offer. But after realizing he would get paid to appear on the show—enabling him to afford his rent—François accepted, becoming the first African American actor to have a recurring role on a children’s television series. For 25 years François appeared on the show while maintaining a separate career as a professional singer. In 1973, his performance with the Cleveland Orchestra earned him a Grammy Award and his love of spiritual music later led him to found the Harlem Spiritual Ensemble. He also spent 16 years as an artist--in--residence at Middlebury College in Vermont until his retirement in 2013. 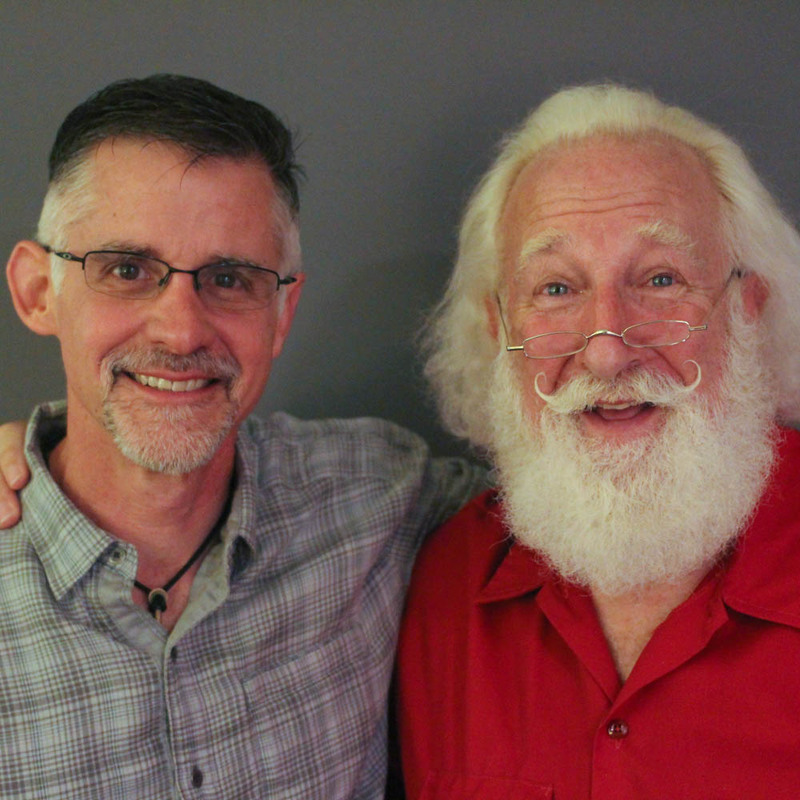 François came to StoryCorps with his friend, Karl Lindholm (pictured together above), to discuss how he became the friendly singing Officer Clemmons, and his relationship with the man known to children as Mister Rogers. 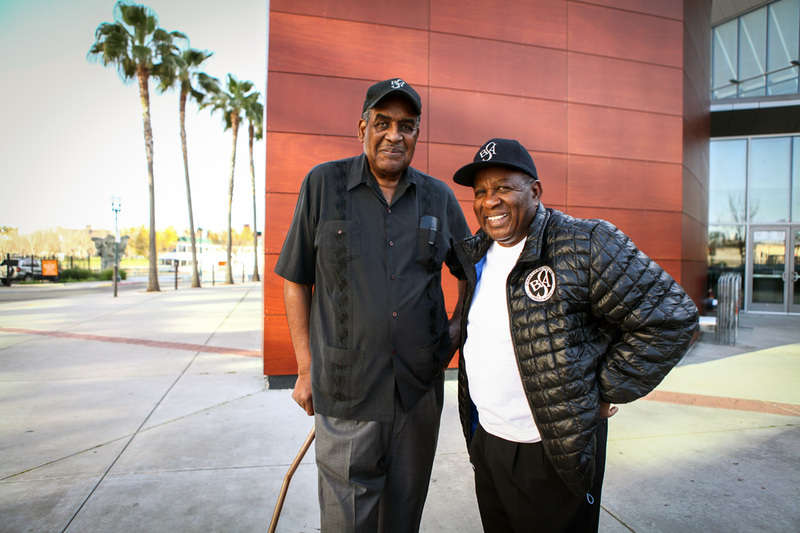 Willie Harris and Alex Brown remember the prejudice they faced as African American stuntmen while breaking into the film industry in the 1960s. Since the Academy of Motion Picture Arts & Sciences announced the nominees for the 2016 Oscars, there has been outrage both online and in the press. For the second year in a row, all 20 individuals nominated in the acting categories are white. The outcry has been so great that the Academy’s governing board voted to add new members in order to increase diversity in the coming years. For some African Americans who have spent decades around the film industry, this continues to spotlight an age-old problem. Willie Harris and Alex Brown came to Hollywood in the 1960s dreaming of breaking into the movies as stuntmen. Both were athletic and strong, but despite their qualifications, stunt coordinators repeatedly turned them away. Realizing that movie studios had little interest in hiring black stuntmen—many wouldn’t even open stages and gyms for them to practice in—they continued to hone their skills training and practicing in public parks around Los Angeles. They would leap from bleachers onto donated mattresses and practice elaborate driving maneuvers using rented cars. Eventually, Willie and Alex were able to break into the industry. They became original members of the Black Stuntmen’s Association spending decades in Hollywood taking and throwing punches in films like The Color Purple and the James Bond classic Live and Let Die. Willie and Alex came to StoryCorps to remember how they broke into the movies. In 1964, Yetta Bronstein, a woman who never existed, ran for President of the United States. Her creators tell the story behind the fake candidate. In the 1964 presidential election, Republican Senator Barry Goldwater from Arizona ran against Democratic incumbent Lyndon Johnson who had assumed office following the assassination of President John F. Kennedy. LBJ won in a landslide, but there was another candidate in the race who has largely been forgotten by history: Mrs. Yetta Bronstein, a Jewish housewife from the Bronx. One reason Mrs. Bronstein remains absent from the history books is that although she ran, she didn’t actually exist. She was the creation of professional media pranksters Alan and Jeanne Abel. The husband and wife team cooked up Yetta while doing a nightclub act, and decided she should run for the highest office in the land. Registering her as a write-in candidate, she was listed as a member of the Best Party, with a platform that included national bingo and lowering the voting age to 18 so that juvenile delinquents would have something to do (the 26th Amendment was ratified 1971). Jeanne, a gifted improviser, posed as Yetta, promising voters 16 ounces in every pound and offering free hot dogs and bagels in exchange for votes. She only gave reporters radio interviews because unlike Jeanne who was in her 20s, Yetta was the middle-aged wife of a New York City cab driver. 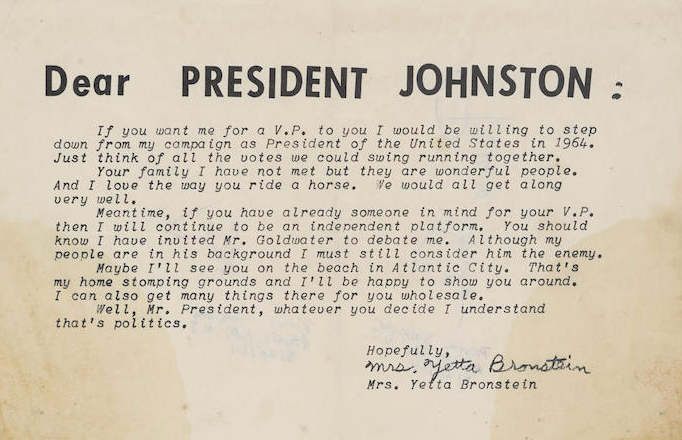 At one point during the campaign, she wrote to President Johnson offering to end her run if he would name her as his running mate (Click here to read Yetta’s letter). Alan, her campaign manager, perpetuated the ruse by using a photo of his own Jewish mother in their election materials. Jeanne and Alan sat down for StoryCorps in their rural Connecticut home. Surrounded by countless boxes filled with documentation of their life’s work, they tell the true story behind their fake candidate. Click here for more information on the Abel’s hoaxes. Clarence ”Clancy” Haskett talks with his friend and former coworker about his long and successful career as a beer vendor for the Baltimore Orioles. This past weekend marked the official opening of the 2016 Major League Baseball season. And while the games now count in the standings, it won’t be until the weather warms up that the competition on the field will really heat up. But in the stands, there is a battle taking place that won’t wait until summer: the fight to be top vendor. As a teenager, Clarence Haskett began selling soda at Baltimore Orioles games back when they played their home games at Memorial Stadium (the team moved to their current home, Camden Yards, in 1992). Over the years, he worked his way up to the vendor’s most prized offering—beer. During his 43-year long career, Clancy has used his quickness and his gift of gab to sell more than a million beers to baseball fans—a number we believe makes him Hall of Fame worthy. Clancy came to StoryCorps with his friend and former coworker, Jerry Collier, to talk about their work and how he got started. Clancy’s story is one of 53 work stories featured in our new book, Callings: The Purpose and Passion of Work. Click here to pre-order Callings before April 19, 2016, and get great gifts from StoryCorps. Two big rig truckers with more than 9 million miles in the driver’s seat between them discuss friendship, adventures, and why they’ll never retire. Idella Hansen started driving big rig trucks in 1968 when she was just 18 years old. At the time, she was pregnant and hungry for independence so she filled a tanker with gasoline, took to the road, and to this day has not looked back. 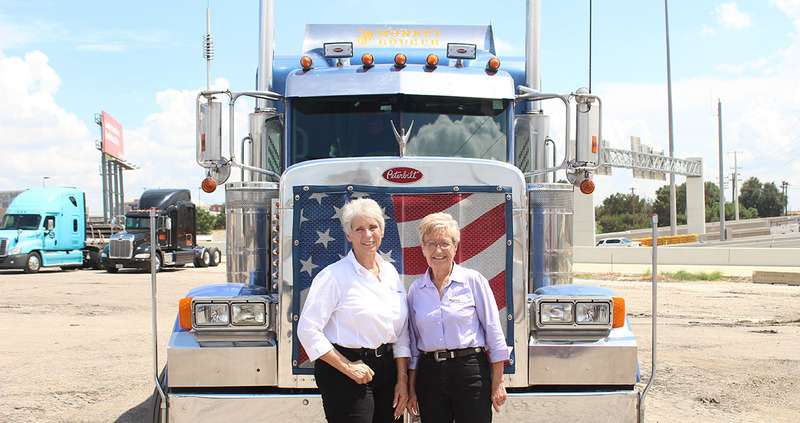 Now 66 years old, Idella has been driving for more than four decades, and her best friend is fellow trucker Sandi Talbott. Sandi, 75, began driving alongside her husband, Jim, in 1979. They drove as partners for years until Jim’s health began to decline and Sandi took over most of the driving. After Jim’s death in 2000, Sandi continued on the road without him, and has now been behind the wheel for over three decades. Together, Idella (top left) and Sandi (top right) have driven over 9 million miles hauling everything from missiles to tadpoles. At StoryCorps they discuss their friendship, their adventures, and why they’ll never retire. Originally aired September 23, 2016 on NPR’s Morning Edition. Vincent Chin was a 27-year-old draftsman living near Detroit. On a June night in 1982, he and a group of friends went out to celebrate his wedding, which was just few days away. 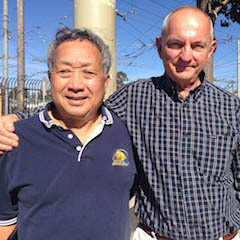 At a bar he crossed paths with Ronald Ebens and Michael Nitz, two auto workers angry about recent layoffs which were widely blamed on Japanese imports. That encounter lead to Vincent’s death. Gary Koivu was with Vincent that night, and he recently came to StoryCorps with his wife, Kim, to remember his childhood friend. The federal case against Vincent Chin’s killers, Ronald Ebens and Michael Nitz, marked the first time the Civil Rights Act was used to prosecute a crime against an Asian American person. It sparked a rallying cry for stronger federal hate crime legislation. Vincent Chin was a 27-year-old draftsman living near Detroit. On a June night in 1982, he and a group of friends went out to celebrate his wedding, which was just few days away. At a bar he crossed paths with Ronald Ebens and Michael Nitz, two auto workers angry about recent layoffs which were widely blamed on Japanese imports. That encounter lead to Vincent’s death. Gary Koivu was with Vincent that night, and he recently came to StoryCorps with his wife, Kim, to remember his childhood friend. The federal case against Vincent Chin’s killers, Ronald Ebens and Michael Nitz, marked the first time the Civil Rights Act was used to prosecute a crime against an Asian American person. It sparked a rallying cry for stronger federal hate crime legislation. 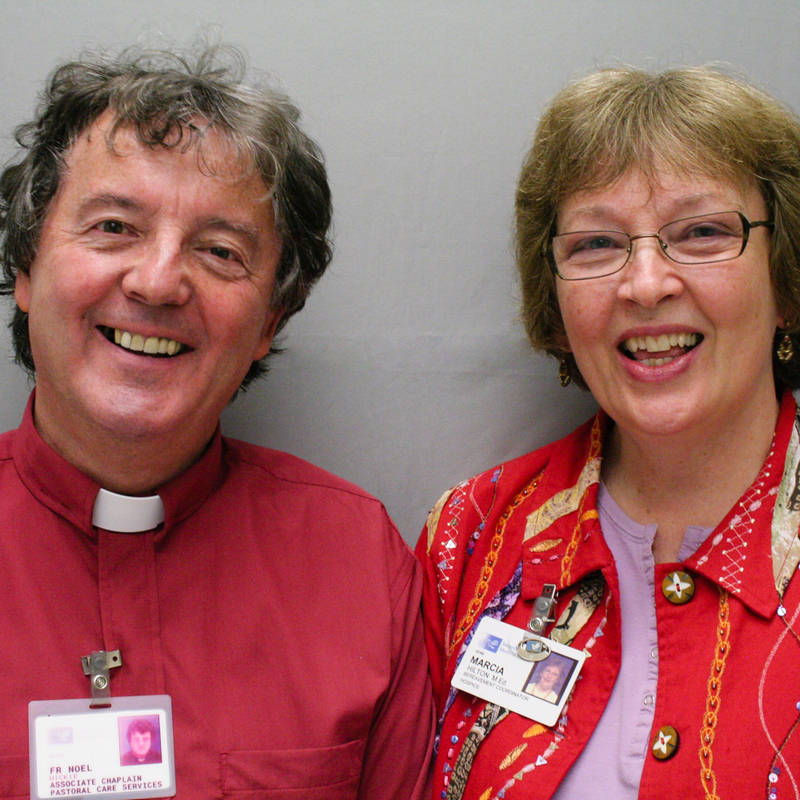 Father Noel Hickie was working as a hospital chaplain when he met Marcia Hilton, a bereavement counselor, at a hospital in Eugene, Oregon. For 25 years, they often worked together on the hospice team, helping patients and their families through illness and death. But when they first started, neither was sure if they were cut out for the work. Marcia retired in 2013, Father Noel in 2015. Father Noel Hickie was working as a hospital chaplain when he met Marcia Hilton, a bereavement counselor, at a hospital in Eugene, Oregon. For 25 years, they often worked together on the hospice team, helping patients and their families through illness and death. But when they first started, neither was sure if they were cut out for the work. Marcia retired in 2013, Father Noel in 2015. When Wally Funk was 8 years old, she jumped off the roof of her barn while wearing a Superman cape, hoping to fly. That desire never left her, and as an adult she became a pilot and flight instructor. But for Wally, the ultimate destination was always outer space. She almost got the chance to go in 1961. That year, she was part of a group of female pilots who took part in tests to determine if women were fit for space travel. The project was run by the same doctor who developed tests for NASA astronauts. The women, who became known as the Mercury 13, passed many of the same tests as the men, but never got to go to space. More than half a century later, Wally Funk hasn’t given up. 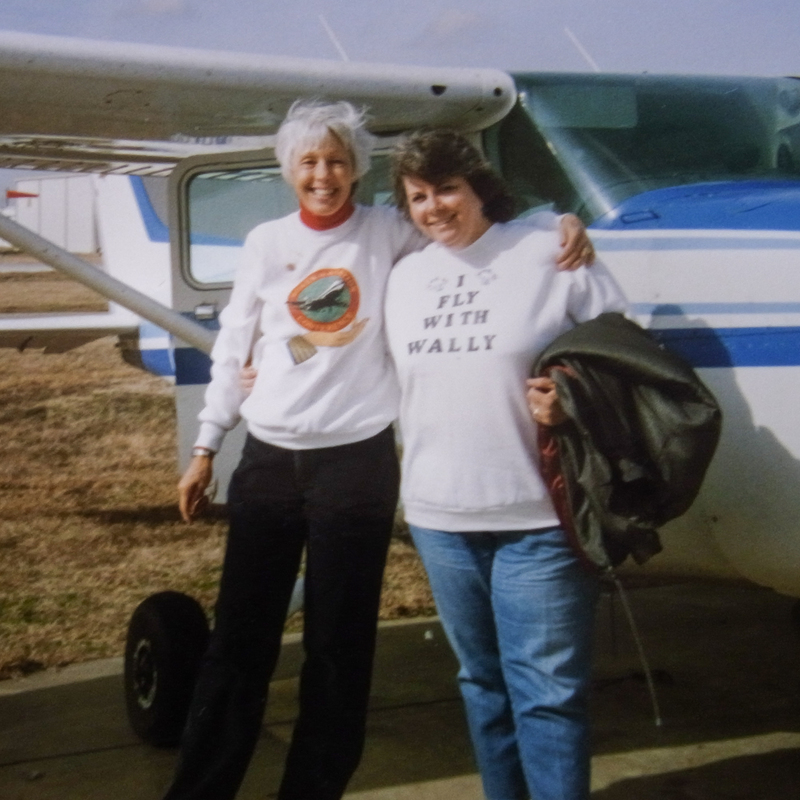 She was interviewed in Dallas by one of her flight students, Mary Holsenbeck. Wally bought a ticket for Richard Branson’s Virgin Galactic and hopes to be onboard its maiden voyage into space. When Wally Funk was 8 years old, she jumped off the roof of her barn while wearing a Superman cape, hoping to fly. That desire never left her, and as an adult she became a pilot and flight instructor. But for Wally, the ultimate destination was always outer space. She almost got the chance to go in 1961. That year, she was part of a group of female pilots who took part in tests to determine if women were fit for space travel. The project was run by the same doctor who developed tests for NASA astronauts. The women, who became known as the Mercury 13, passed many of the same tests as the men, but never got to go to space. More than half a century later, Wally Funk hasn’t given up. She was interviewed in Dallas by one of her flight students, Mary Holsenbeck. Wally bought a ticket for Richard Branson’s Virgin Galactic and hopes to be onboard its maiden voyage into space. Brian Peterson, 31, is an artist — he designs cars for a living — who lives in Santa Ana, California. Matt Faris, 38, is a homeless musician who would often sit outside Brian’s apartment building. For several months, Brian passed Matt on his way to and from work. Then, one day, Brian decided to introduce himself. The friendship they would go on to develop would have a surprising influence on them both. After befriending Matt, Brian started a non-profit called Faces of Santa Ana, for which he paints portraits of people in the homeless community and donates the proceeds from the sales of his work to his subjects. Matt Faris finished recording his album, Polar Scale, in 2017. It will be available on December 4, 2017. Brian Peterson, 31, is an artist — he designs cars for a living — who lives in Santa Ana, California. Matt Faris, 38, is a homeless musician who would often sit outside Brian’s apartment building. For several months, Brian passed Matt on his way to and from work. Then, one day, Brian decided to introduce himself. The friendship they would go on to develop would have a surprising influence on them both. 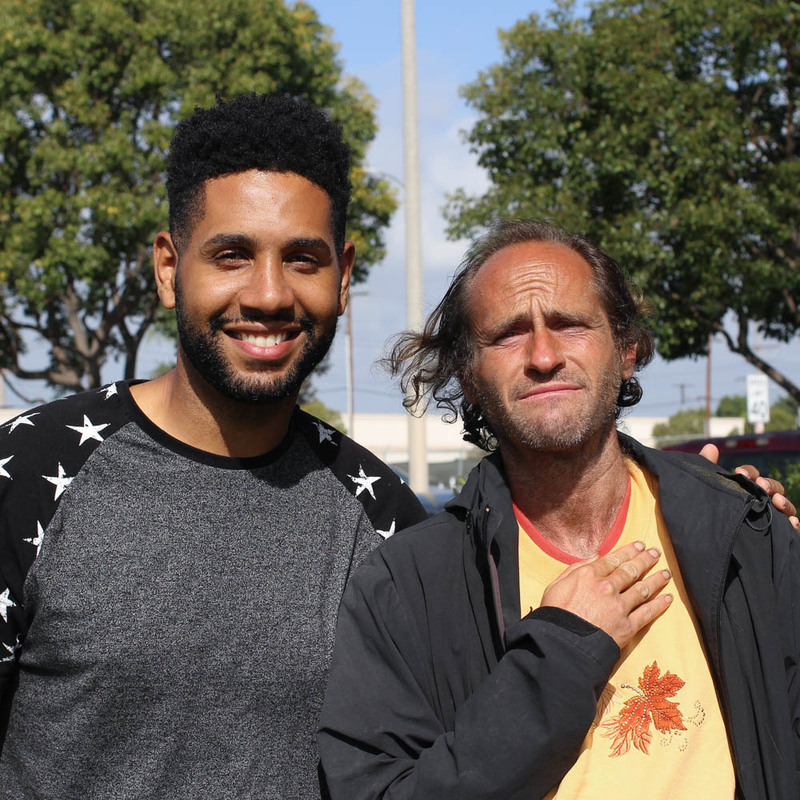 After befriending Matt, Brian started a non-profit called Faces of Santa Ana, for which he paints portraits of people in the homeless community and donates the proceeds from the sales of his work to his subjects. Matt Faris finished recording his album, Polar Scale, in 2017. It will be available on December 4, 2017. 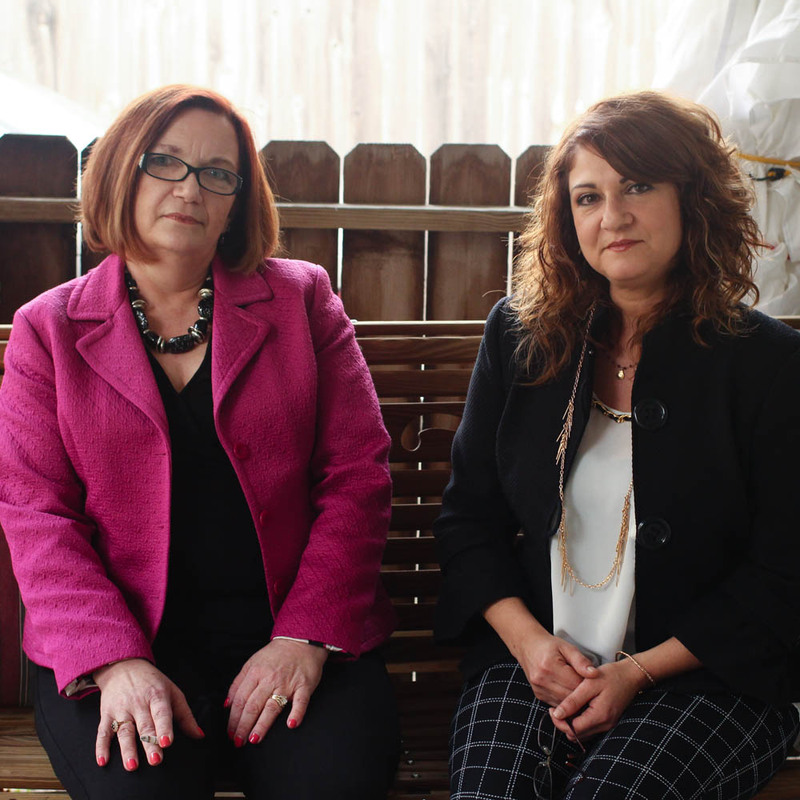 This is a story of two women brought together by an unintended consequence of the opioid epidemic. As of late 2017, as the number of deaths skyrocketed, about one out of every 10 organ donors had died of an overdose. When 21-year-old Adam Shay overdosed on heroin in 2014, his pancreas and kidney were donated to a stranger, Karen Goodwin, who was a recovering addict herself. At the time of her transplant, she had been sober for 13 years. Karen reached out to Adam’s mother, Marlene Shay, a year after his death. They sat down for this conversation at StoryCorps in Beachwood, Ohio. This is a story of two women brought together by an unintended consequence of the opioid epidemic. As of late 2017, as the number of deaths skyrocketed, about one out of every 10 organ donors had died of an overdose. When 21-year-old Adam Shay overdosed on heroin in 2014, his pancreas and kidney were donated to a stranger, Karen Goodwin, who was a recovering addict herself. At the time of her transplant, she had been sober for 13 years. Karen reached out to Adam’s mother, Marlene Shay, a year after his death. They sat down for this conversation at StoryCorps in Beachwood, Ohio. Joanna Wright and her friend Tara Cummings talk about surviving years of abuse at a religious reform school in Louisiana. 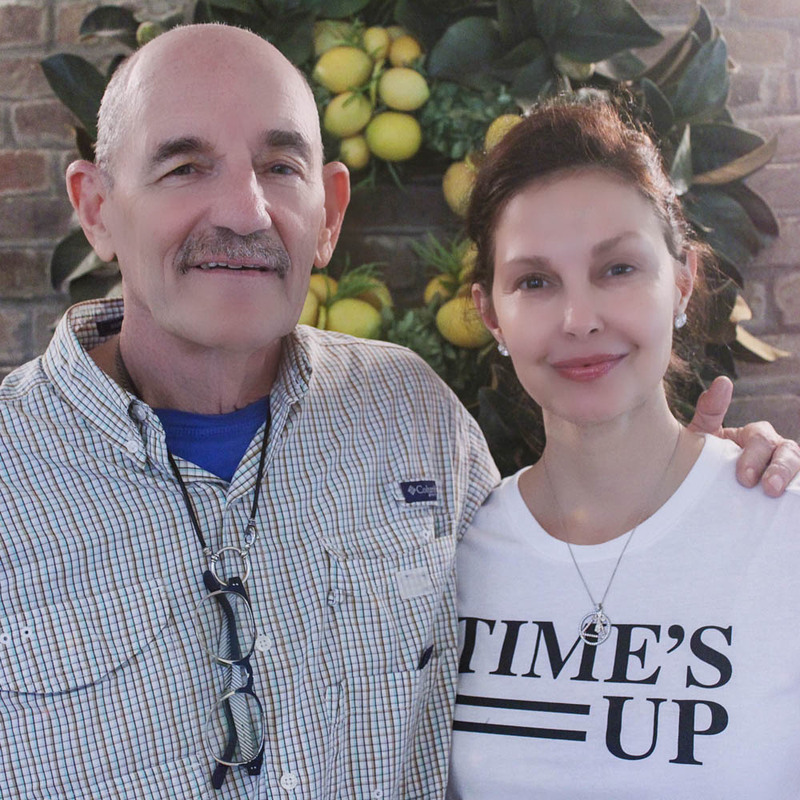 Actress Ashley Judd talks to her friend Ted Klontz about summoning the courage to come forward about Harvey Weinstein’s abuse. Vince Cantu and Joe Galloway were childhood friends in the tiny town of Refugio, Texas. After graduating high school, they didn't see each other for years, until they met in a place they didn’t expect. When Dr. Lora Koenig and Dr. Zoe Courville met in the middle of the Greenland ice sheet while doing climate research, their friendship helped them navigate the challenges of their work and life. Allan Fuks talks with former classmate Spencer Katzman about what it was like growing up with a name that looked like the mother of all curse words. Greg Yance and Neoma Farr worked alongside each other during the Great Flood of 1993, to gird the town of Niota, Illinois from the rising waters of the Mississippi River. 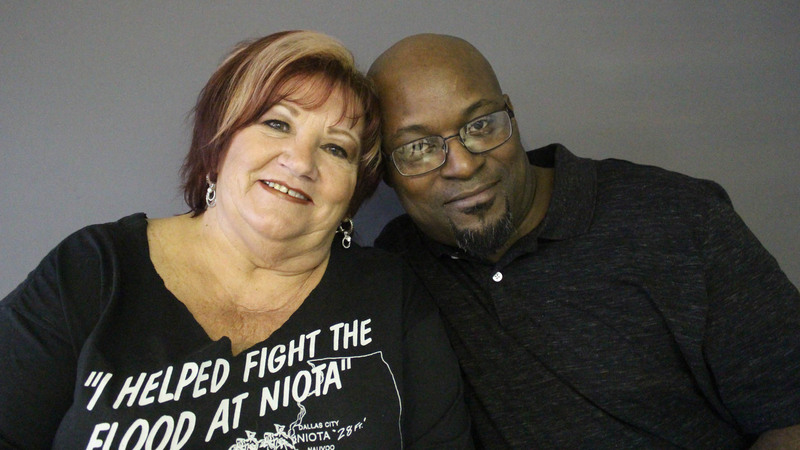 They never knew each other’s names, but sat down to talk with one another 25 years later. 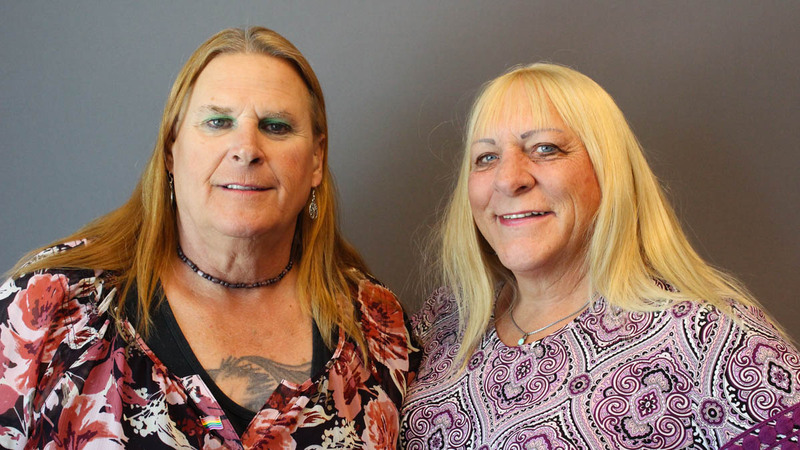 Best friends, Sue McConnell and Kristyn Weed, talk about their military service and their experience as transgender women. In 2017, Heather Heyer was killed while protesting against a white nationalist rally in Charlottesville, Virginia. Her supervisor from the law office she worked in, Alfred Wilson, sat down with her mother, Susan Bro, to remember her. SB: So you took a chance. AW: Yeah. She could communicate with anyone. And, you know, I’m a black male and I might walk out to meet a client and Heather would notice that sometimes they didn’t shake my hand, and that would just infuriate her. And I’m like, ’Where does she get this from?’ Because she grew up in this little small place that’s not that diverse. SB: She comes from a long line of stubborn people — stubborn and opinionated and not afraid to say so. That day of the rally, what time did I call you from the hospital? AW: About two o’clock. I remember my wife told me, ’Oh my God, Alfred. Do you see what happened on the TV?’ And she didn’t know that I was on the phone talking to you. I remember thinking, ’She’s going to tell me that Heather’s hurt.’ But you didn’t tell me that. And then everything was so quiet like somebody had shut the volume control off on the world. SB: For me, losing my daughter was like, you’ll have a lot of tears one time then you’ll go numb for awhile. And, uh, I’m glad you’re finally able to let some of yours out because you worried me there for awhile. AW: Yeah. In May, I was going to have two kids graduating at the same time, and all I could think was I wanted her to be there. AW: But one of the plus sides was when you showed up to the graduation party. SB: For me, grief is like standing in the shallows of the ocean, knee-deep in the water. Every so often a wave will wash over. And so I allow myself to cry and be really sad while that wave is there. But I know that it will go away, and that’s what gets me through. 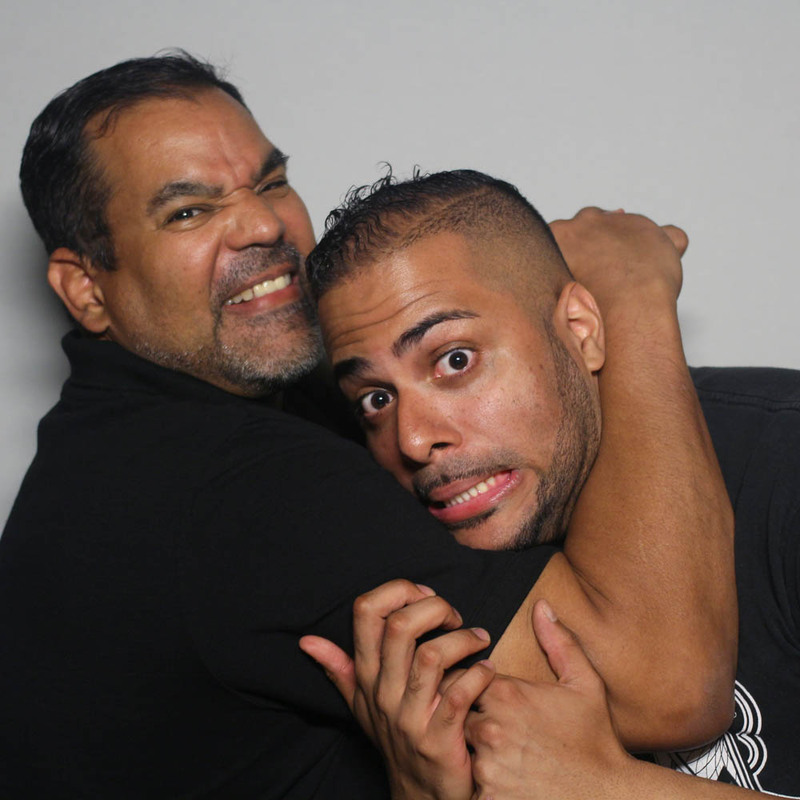 StoryCorps: Abraham Guzman and John Torres Jr.
John Torres Jr. talks to his friend, Abraham Guzman, about his dad’s career as a wrestler, and his legacy in and outside of the ring. 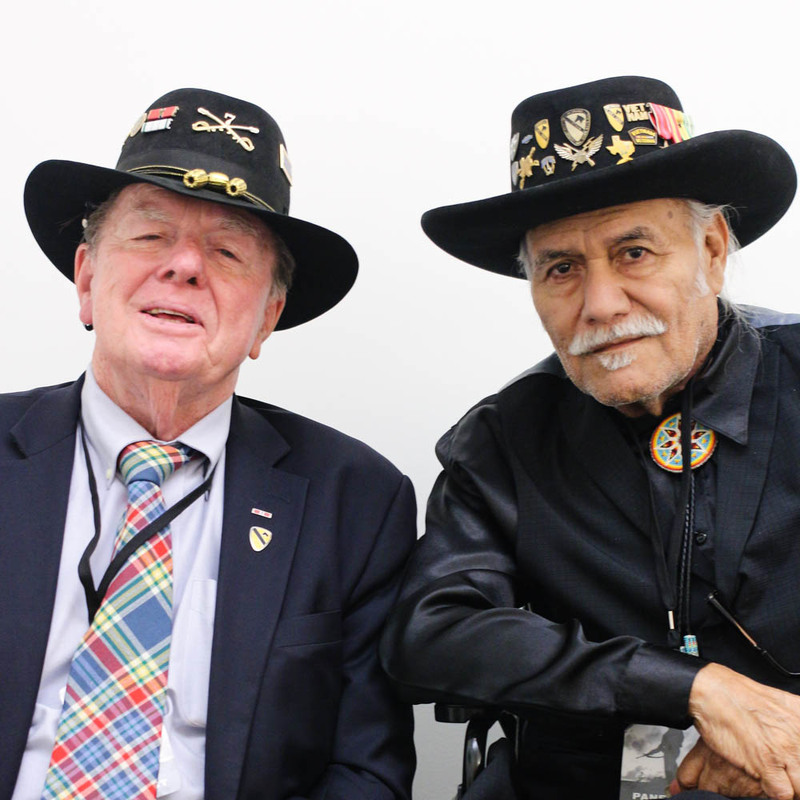 50 years after serving together in Vietnam, Army veterans Kay Lee and John Nordeen sat down for StoryCorps to remember how they first met. 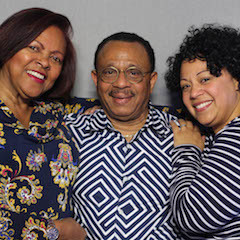 50 years after arriving in the United States from Honduras, Roy Daley sat down with his daughter Lucy and wife Ana to reminisce about his first Thanksgiving dinner. Larry Dearmon and Stephen Mills met during the height of the AIDS epidemic in Little Rock, Arkansas. They remember the loss that eventually brought them together. This is a story about Santa Rick Rosenthal of Atlanta, Georgia -- who also happens to be Jewish (Modern Orthodox, to be precise). 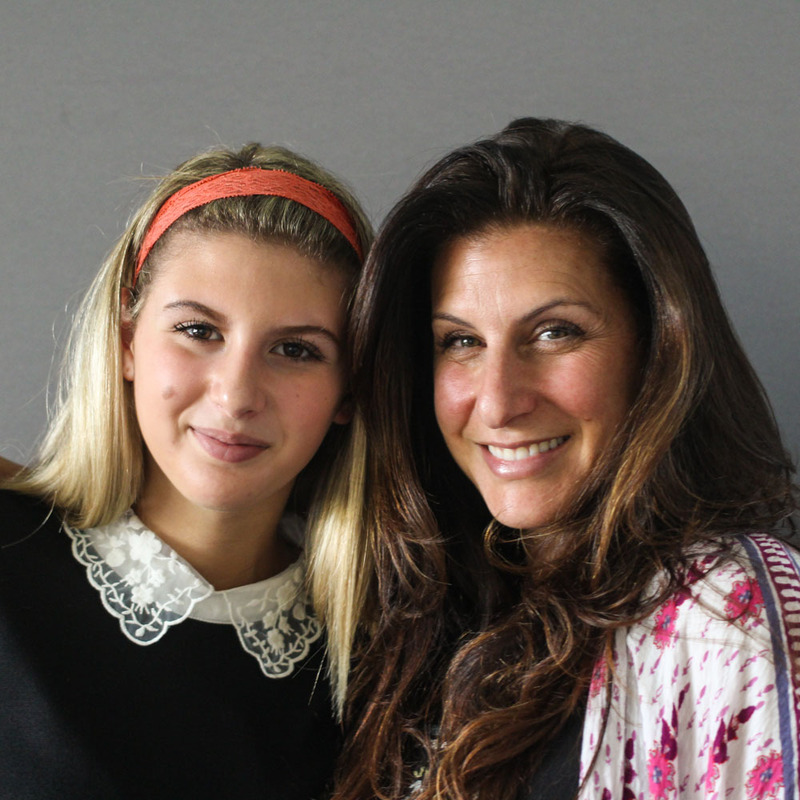 Maya Altman tells her mom, Robyn Altman, about her memory of the Marjory Stoneman Douglas High School shooting.